Sunning myself on a beach in Florida isn’t on the agenda, but it is time for a holiday of sorts. That is why I’m declaring “March Break” and will not be posting again for the duration of the month. My real hope is that I can spend a great deal more time in the studio and get a solid body of new work well under way. I will return in April with a fresh batch of artists for your viewing pleasure, and who knows, maybe even a tan (not likely, but a man can dream.) Until then, thank you for reading, and have a great month! Here’s wishing a happy holiday weekend to all our readers south of the border! 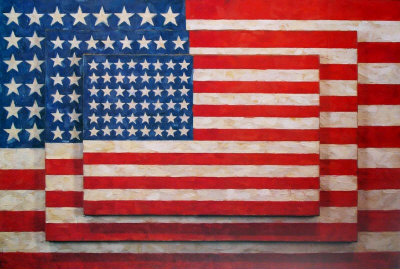 Flag painting courtesy of Jasper Johns. 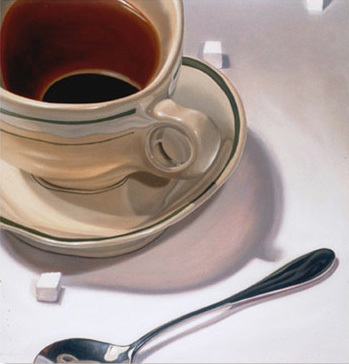 With his current series of paintings Fred Lynch seems to be indulging both a caffeine habit and a surreal perspective. His painted coffee cups are beautifully rendered in their varying degrees of distortion. 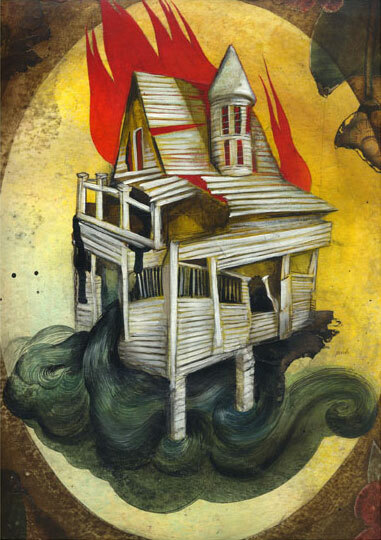 Bonus: he also has plenty of great illustration work on his site! No Power = No Posts. I apologize for the lack of art today, but a long-lasting power-outage has left me in the dark. I will be back soon though, with plenty of paintings for all! Simon Jensen is able to create a sense of being alone among others, which elevates his paintings into the realm of social commentary, not to mention the fact that he’s creating great visuals. Check out the work to see for yourself. 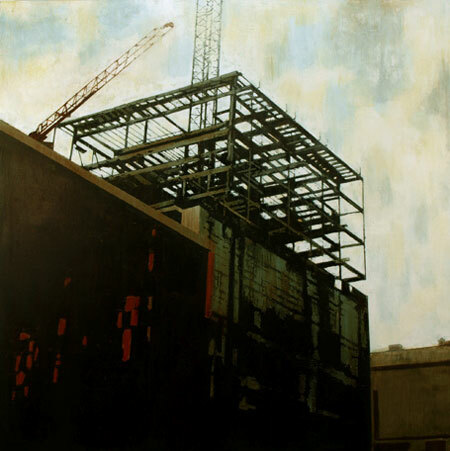 There are some beautiful industrial landscapes to be seen over on Antoine Claes’s site. My french is pretty rusty (and before it was rusty it was non-existent) but I believe Claes cites Toronto as the inspiration for these works, so maybe all the condo development around here is actually serving a useful purpose! Happy Labour Day! I spent the weekend in New York State, and found once again that American cities are full of architecture compelling me to paint. Since I wasn’t able to pull out a canvas and create some urban landscapes at the time, I did the next best thing, which was to find an artist who already had. 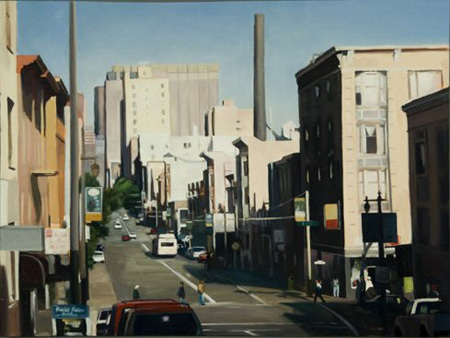 Erica Pollock’s urban landscapes are inspired by San Francisco, and are fantastic celebrations of form and colour. Great stuff! There isn’t very much information on her site about the work, but Pamela Henderson has some very cool paintings that luckily speak for themselves. 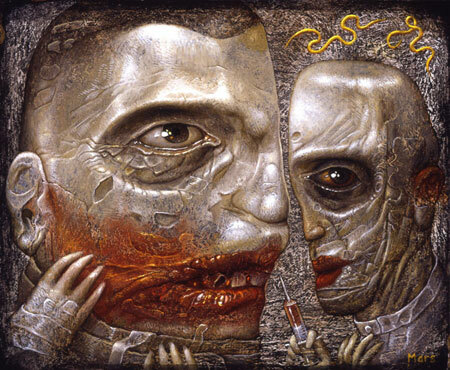 Chris Mars creates incredibly powerful images inspired by the childhood experiences that resulted from his older brother being institutionalized after being diagnosed with schizophrenia. 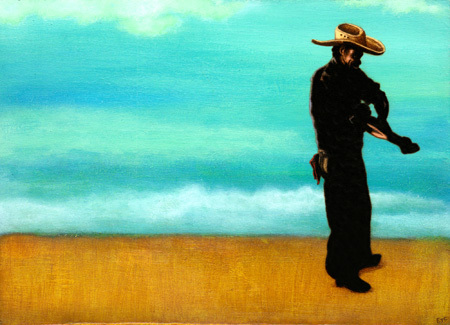 The paintings tell an incredible story, one that reminds me of a similar story told by David B. in graphic novel form. To say that these are stories worth telling is a gross understatement. 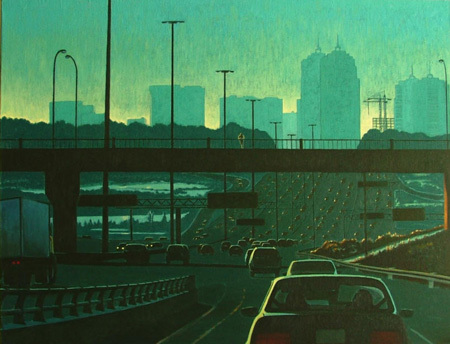 Thank you to everyone who came out to the Toronto Outdoor Art Exhibition this past weekend! It was a great time, filled with amazing art. …and now back to the business of blogging. Posted images are the property and copyright of their respected creators and/or owners.